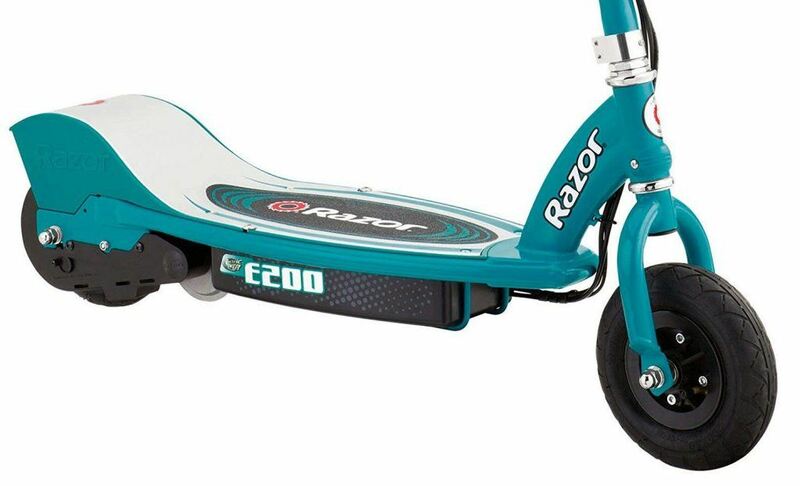 If you have a teenager in your home, you most likely know about Razor's electric scooters. They are great, durable products that are very popular amongst teens and young adults. My bike was getting old, and walking to work was simply out of the question for me. It would take too much time out of my day, so I decided to look into a scooter that could get me where I need to go at a quick rate of speed. The Razor E200 is the scooter that I selected, and I am so happy that I did. Let's take a look at some of the reasons why I love this scooter so much. The Razor E200 features a sleek design that is offered in a few nice color options. I really like the teal option because as with all of their color options, they are not designed for a female or a male specifically. They simply have bright, vibrant color options that are pleasing to look at. The deck is silver with the Razor logo across it, which also serves as a grippy material on the deck. In addition, I can easily put both of my feet on the deck at once, making it more comfortable to ride. The handles are rubber so that they are comfortable to hold, and there is a hand brake on the left handle that is convenient to use. Insofar as transporting this scooter, it is slightly heavier than I would like, but it is still light enough to carry it when you need to. This scooter does not fold in any way, so it may be more difficult to store in smaller spaces. I wish that it could fold easily into my locker at the gym, but luckily, there is an area inside where I can safely keep it. There is a kickstand that you can use to keep it stable as well. This scooter is great for a teenager or an adult who needs a way to travel that is convenient. It is rated for anyone who is less than 152 pounds, which means that this scooter can accommodate teens until they are adult age and maybe longer in some cases. 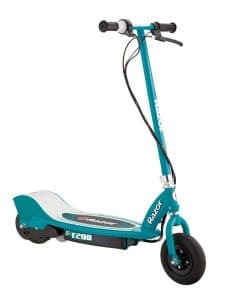 I would not recommend this scooter for anyone under the age of 13 because it does have some pep to it, and you don't want smaller children being injured while riding it. In addition, the handlebars do not have the ability to adjust, so it may be more difficult for someone to ride if they are taller than five foot and six inches. The wheels on this scooter are eight-inch models that are able to maneuver across off-road terrain, but they work best on flat, paved surfaces. I like the fact that this scooter can begin moving from a standing position, meaning that you do not have to kick up to speed to get the motor running. In fact, it can reach about 12 miles per hour in a few seconds. 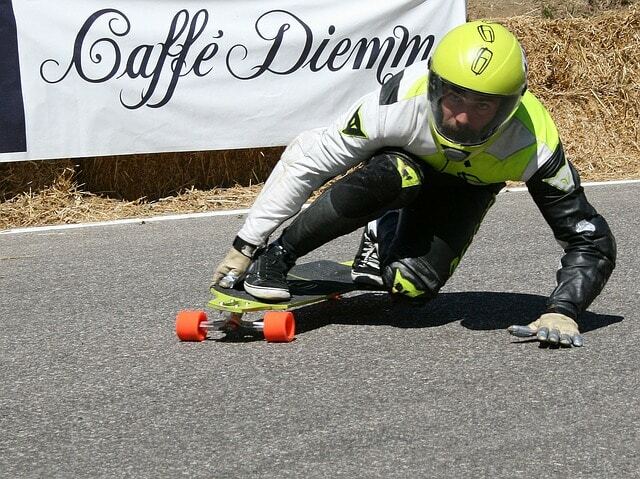 This scooter is designed for racing downhill. If you notice, the tires are extra wide, which allows you to hit pebbles and small cracks and inconsistencies in the pavement without noticing them. Even at top speeds, the tires will absorb the bumps and give you a smooth ride. This scooter is one of the fastest electric scooters that Razor offers. The motor on the Razor E200 is very quiet. This scooter can start from a stationary position. The battery takes quite a bit of time to recharge; in fact, it can require as much as 12 hours of time. It is not that great for riding on off-road terrain. It does not fold into a smaller, more compact size that is convenient to carry. If you are looking for a fast scooter that can get you where you are going, then the Razor E200 is a great option for you. It is not good for tricks or off-road terrain, but it is a great option for commuting that will get you to work without you breaking a sweat.